The historic LF Ranch is, simply put, one of the most magnificent Montana ranches to become available in decades. 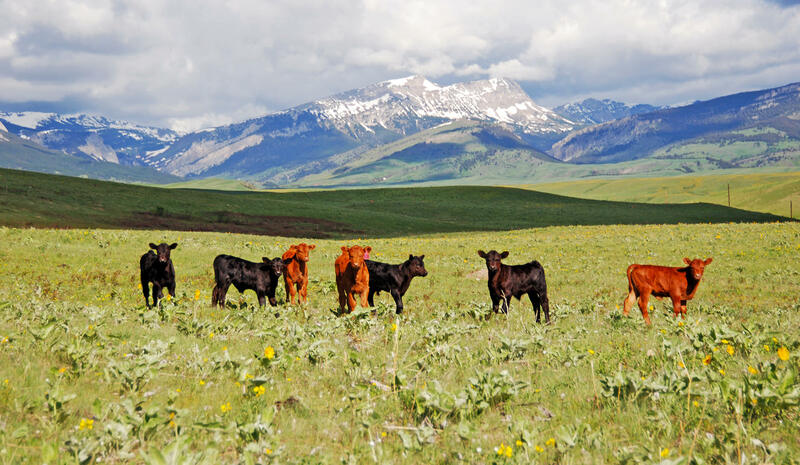 The Ranch encompasses almost 42,215 deeded and leased acres, a sizable property even by Montana standards. 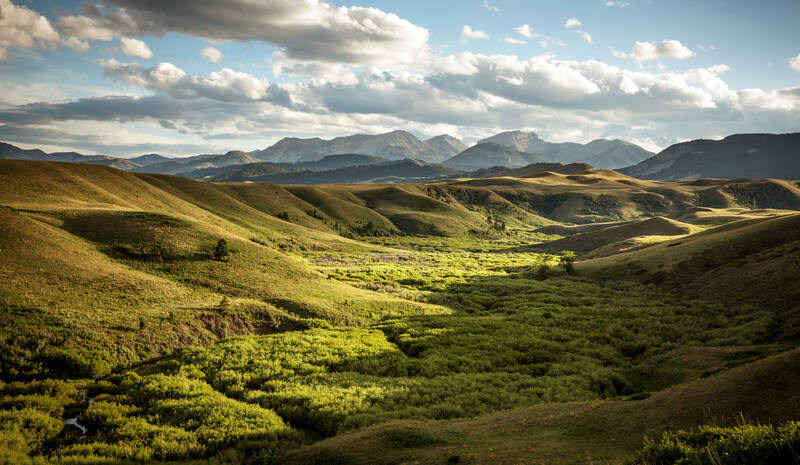 But it is the astounding diversity of this wild and pristine acreage — almost all of which is enclosed within ranch boundaries that makes the LF so spectacular and unique. 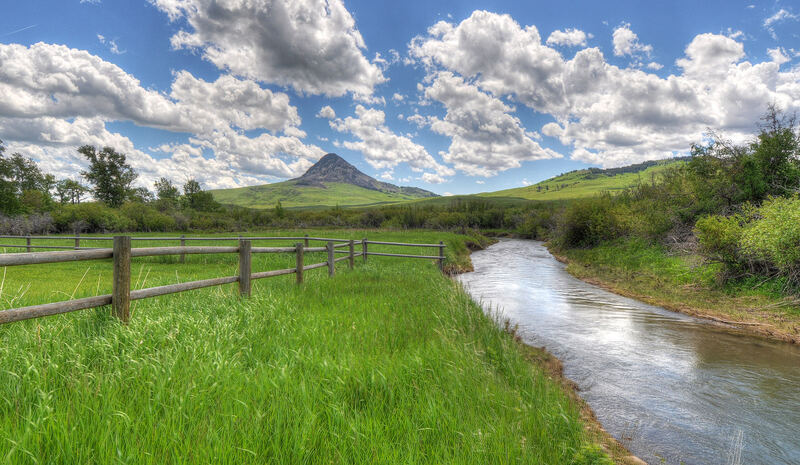 The Ranch rises from lush prairie grasses through riparian zones along its many creeks, past the iconic Haystack Butte, and up the Rocky Mountain Front to the Lewis and Clark National Forest, with which it shares a boundary for almost eight miles. The Rocky Mountain Front wraps around the Ranch on the south and west, forming what is, in effect, a privately-owned preserve with all the attributes of a national park. This is the heart of the Crown of the Continent, one of only two intact ecosystems remaining in the lower 48 states, and home to possibly the richest collection of wildlife in North America. The LF Ranch is a jewel in that crown. Five spring-fed streams, offering over 37 miles of trophy trout fisheries, and over 113 miles of riparian habitat serpentine through the Ranch creating private fisheries that yield large, healthy populations of rainbow and brown trout. Virtually every mammal known to the American Rockies – elk, mule deer, white tail deer, antelope, moose, bighorn sheep, grizzly bear, wolves, mountain lion – lives here, as well as grouse and Hungarian partridge. The plethora of wildlife coupled with the diverse terrain, running waters and the protected boundaries makes for unmatched outdoor experiences, whether fishing, hunting, hiking or horseback riding. The Ranch currently runs about 1,300 head of cattle and produces about 700 tons of hay annually. This is a low-overhead operation that, under present ownership, has consistently operated in the black. Facilities including barns, chutes, docks and pens, are well maintained and efficient. The residential improvements, including a charming owner’s cabin, are modest but comfortable and designed for recreational use and utilitarian staff housing. The LF has had only two owners since famed Montana rancher J.B. Long first assembled the property in the early 1900s. Over the last 30 years, the current owners have enhanced the holding with strategic acquisitions and careful stewardship of the land and native habitat. The result is a legacy ranch of unsurpassed beauty and biodiversity that also presents an attractive land and conservation investment. The Crown – aptly named for its majestic geology – forms the spine of the Rocky Mountain Front and the eastern edge of the Continental Divide. It extends from the northern Canadian Rockies in British Columbia and Alberta southward into Montana through Glacier National Park to Rogers Pass. Rugged limestone peaks, sheer walls, protrusive reefs and deeply cut canyons provide a view scape like nothing else in North America. Some of the nation’s most important protected wilderness areas are here: The Crown is 10 million acres including the Lewis and Clark National Forest, which spans 2,912 square miles; the Bob Marshall Wilderness Complex, the fifth largest wilderness area in the lower 48 states at over 1 million acres; and the Scapegoat and Great Bear Wilderness Areas are more than a half-million acres within the national forest — all adjoining the LF. Here, in the wildest part of Montana's Rocky Mountains, are the headwaters of many major North American rivers and the origins of the Pacific and Atlantic Oceans and Hudson Bay. This special corner of Montana has a tangible, yet undefinable quality of life and land; much of it remains the way that Lewis and Clark experienced it over 200 years ago. The LF is one with the Crown and possesses its own special geological features. Haystack Butte, an ancient volcanic plug, stands sentinel in the midst of the LF. At 6,800 feet above sea level, the peak is an iconic regional landmark, first remarked upon by Meriwether Lewis. The topography of the LF ranges from the rugged peaks along the western and southern boundaries that transition to mountain valleys, grassy benches to productive riparian bottoms. The backdrop of The Front to the west is captivating with snow-capped peaks and timbered hill sides to the rolling hills and pastures that contain healthy stands of native grass species. 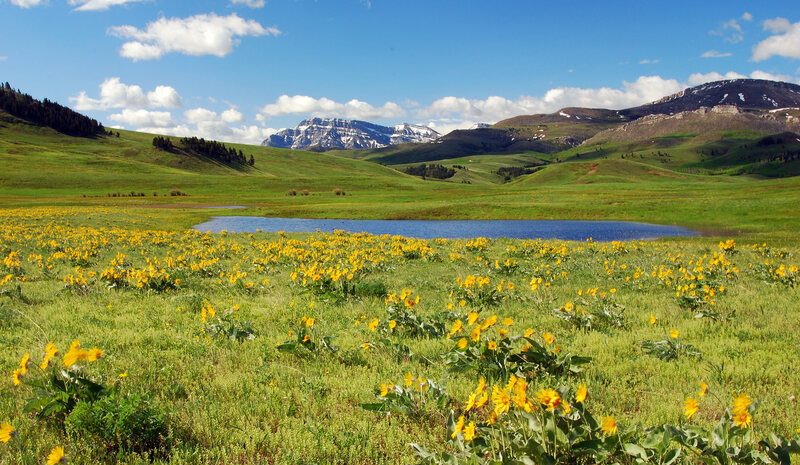 The Lewis & Clark National Forest, which borders the Ranch on the south and west for approximately eight miles, protects it from encroachment and shares the same marvelous biodiversity of the region. The Nilan Reservoir borders the Ranch on the northeast corner, with a finger of the lake extending into the Ranch. Five significant spring-influenced creeks — Ford, Smith, Goss, Blubber and Elk — flow from west to east through the various drainages within the Ranch. The Headquarters of LF Ranch is located off Smith Creek Road, 12 miles west of Augusta. This quaint western town, population 315, boasts restaurants, a gas station, grocery store, post office and local watering holes, including the popular Buckhorn Bar for great dining, refreshments and local color, or stop for an espresso drink at Latigo and Lace. The Augusta public school system serves the surrounding area and features small, multi-grade classrooms. Augusta High School, a Montana High School Association Class C school (fewer than 160 students), offers competitive interscholastic athletic programs. School bus service provides round-trip transportation for elementary and high school students in the area. The Augusta community has been supportive of the school system and has historically supported school bonds for capital improvements and upgrades. Choteau, the Teton County seat, is about 20 minutes north of Augusta and provides a range of services including banking, health care and a jet capable runway. Founded in 1932, the University of Providence, formerly University of Great Falls, is a private, Roman Catholic liberal-arts university located in Great Falls on 44 pristine acres. UP, which serves approximately 1,117 undergraduate and graduate students, offers about 60 certificate, associate, undergraduate and graduate programs in traditional liberal arts and sciences and in healthcare fields. In addition to its campus offerings, UP serves 31 sites in Montana, Southern Alberta and Wyoming through its Telecom Distance Learning Program. For those interested in athletics, the University of Providence ‒ nickname: the Argonauts ­‒ participates in a variety of men’s and women’s sports in National Association of Intercollegiate Athletics (NAIA) Region I and is a respected member of the Frontier and Cascade Conferences. The Great Falls International Airport serves Alaska, Allegiant Air, Delta and United Airlines. Currently, direct flights are available to Denver, Las Vegas, Minneapolis, Phoenix, Salt Lake City and Seattle. For up-to-date flight schedules and airport information, please refer to the airport website: www.gtfairport.com. There is a well-maintained paved public airstrip situated on the northeast edge of Choteau, 38 miles from the Ranch. Located at an elevation of 3,942', the 75' x 5,000' asphalt runway is in good condition. Communications for this facility are available through Salt Lake City at Frequency 133.4/285.4 (Great Falls RCAG). Augusta Airport (3U5) has a 3,650' x 75' turf runway at 4,145' elevation that is in fair condition. For additional information, contact manager Tim Connley at 406-444-2506. The Ranch also has a grass airstrip that is maintained and suited for single-engine aircraft, such as a Cessna 182 or 206. The strip could easily be extended for larger aircraft. The big game hunting, wing shooting and trout fishing on the LF are truly world class and have been enjoyed for decades by a select and notable group of sportsmen, including leading environmentalists, conservationists and chief executives of sporting companies. The private small stream and spring creek fishing on the LF is simply astounding. It is not an overstatement to say that the LF is the finest fishing ranch to hit the Rocky Mountain market in a generation. The LF is laced with springs, creeks, seeps, still ponds and lakes. The largest of the fishing creeks -- Ford, Smith, Goss, Blubber and Elk Creeks — flow through the Ranch for approximately 37 stream miles. 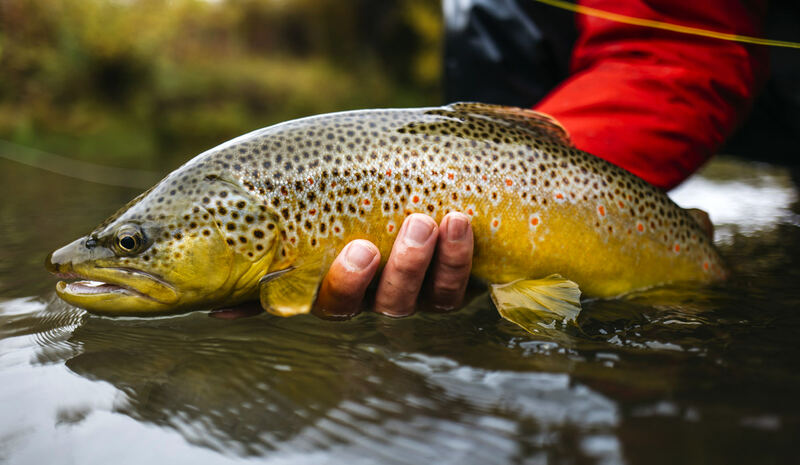 All of these fisheries hold remarkable numbers of trout, including some very large brown trout that regularly exceed 20 inches; several ponds, including the sizeable Smith Pond, offer exceptional still water fishing. The creeks rise from springs on the Ranch and from the adjoining wilderness areas and flow through the heart of the Ranch, thus creating a private fishing reserve that is unrivaled. 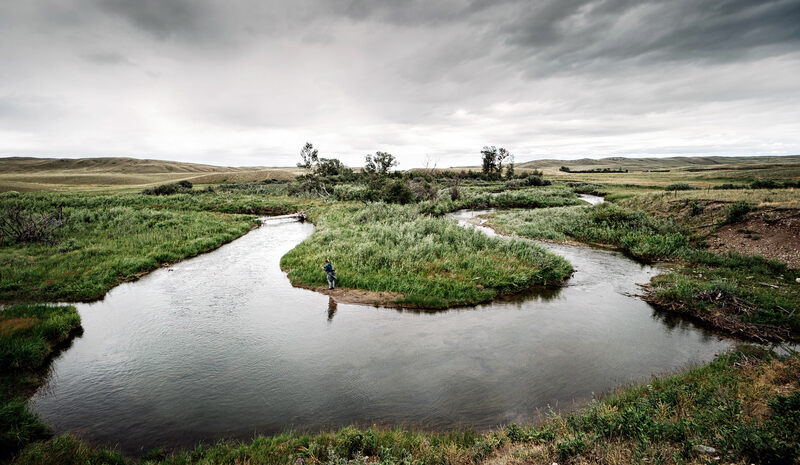 It has often been said that an angler never steps in the same water twice and the diversity of the riffles, pools and grassy banks with deep corners that course through the Ranch will challenge and captivate anglers for a week, a season and a lifetime. Should the day come that an angler wants to venture off the Ranch, the famed nearby waters of the Dearborn, Sun and Missouri Rivers are all within an easy hour drive. Many consider the stretch of the Missouri River from Holter Dam near Wolf Creek downstream to Cascade the finest river in the State. The Sun and Dearborn Rivers originate in the renowned Bob Marshall Wilderness and offer less traveled fishing experiences. Local reservoirs including Nilan, which borders the northeast corner of the Ranch, Pishkun and Willow Creek offer additional still-water angling opportunities and in the heat of the summer are popular local boating destinations. As the summer fishing season transitions into fall, and sporting pursuits turn to the field, the big-game and wing-shooting opportunities on the LF are simply spectacular. The LF is home to moose, elk, bighorn sheep, mule and white-tailed deer and antelope. In September and October, the spectacular bugling and rutting displays of mature bull elk that occur throughout the LF etch permanent memories. Trophy record-book bulls are taken annually during archery and rifle season. 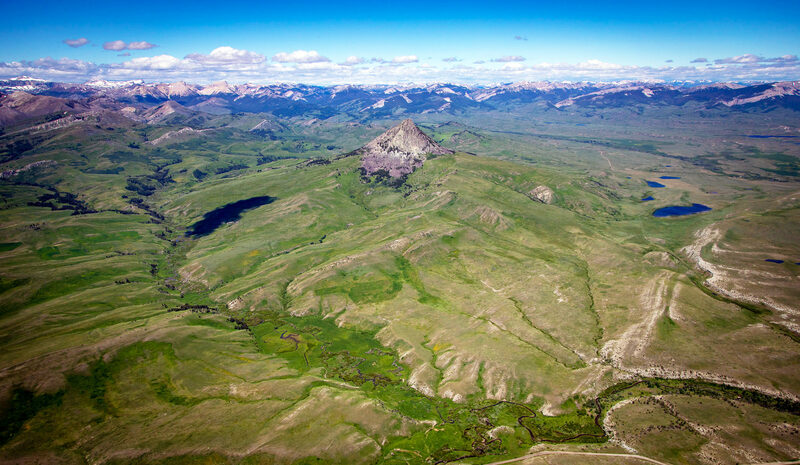 With historical knowledge and many days in the field, ranch managers have defined nine distinct elk hunting zones that provide exceptional, unique and incredibly private experiences. The Ranch is located in hunting District 442, which is a general ‘over the counter’ tag for elk and deer. With the burgeoning elk population in the area, the hunting season is generous and extends from September through February. For details on purchasing non-resident tags, specific regulations and additional information please refer to the Montana Fish, Wildlife and Parks website at www.fwp.mt.gov. Significant populations of Hungarian partridge and sharp-tailed grouse are observed throughout the Ranch. The seasonal grain fields through the core of the Ranch provide a readily accessible food source, which combines with an extensive riparian habitat along the creeks to greatly enhance the quality and numbers of wildlife. This habitat is apparent through the abundant numbers of elk, whitetail, mule deer and antelope scattered throughout. 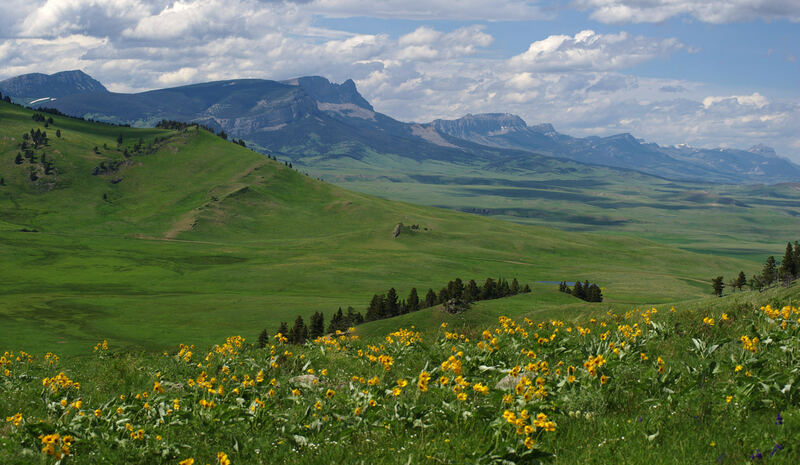 North Central Montana offers endless opportunities for outdoor recreation from hunting, fishing, hiking, and camping to golfing in the shadow of the Rocky Mountains. Bob Marshall Wilderness Complex. Located just west of the Ranch, “the Bob,” with 1.5 million acres, is the fifth largest wilderness area in the United States. Protected by the Wilderness Act of 1964, which prevents the construction of roads or structures and prohibits motorized vehicles and mechanical equipment, the Bob Marshall Wilderness area is accessible by foot or horseback via an extensive trail system. Hunting, fishing and camping are allowed with the proper permits. Grizzly and black bears, moose, elk, mountain goat, bighorn sheep, wolverine, wildcats, and lynx live here. Its vast, pristine beauty and magnificent wildlife make the Bob Marshall a bucket-list trip for outdoor enthusiasts worldwide. Freezeout Lake. Northeast of the Ranch, near the town of Fairfield, lies Freezeout Lake. While this Wildlife Management Area offers hunting, wildlife viewing, and iceboating in winter, it is also the primary staging area for snow geese in their spring migration from the Gulf States. In early March as many as 300,000 snow geese and 10,000 tundra swans gather at the lake to rest before continuing to the extreme northwest Arctic Coast of Canada. The LF lies along and under this major flyway and the sounds of thousands of migrating birds are heard for days each fall and spring from overhead. Golf. The Harvest Hills Golf Course in Fairfield, features a “challenging but friendly” 9-hole public course against the beautiful backdrop of the Rocky Mountain Front. Golfing is available at the public Choteau Country Club, as well as a new course at the Eagle Falls Golf Club in Great Falls. Missouri River. For many decades, travelers have journeyed down the Missouri River to see the inspirational rock formations and limestone cliffs. Scenic boat tours are available to enjoy the beauty that has not changed since the days of Lewis and Clark. To gain additional knowledge of the “Corps of Discovery” Expedition and the history of the area, it is well worth visiting the Lewis and Clark Interpretive Center in Great Falls, which offers lecture series, films, and exhibits. This low-overhead cattle operation runs with only two full-time men during the entire year. There is minimal farming and irrigation. The cattle are hardy and primarily calve on their own. The operation currently calves in early April, primarily to minimize stress on cattle, lower labor costs, and reduce the amount of hay fed annually. The Ranch utilizes three major pasture grazing programs — a calving block, a summer pasture and winter pasture — with the goal of reserving a third of the Ranch untouched going into the winter months. On a typical year, the Ranch feeds about a quarter ton of hay per cow. With rotational grazing of the spring and summer pastures, the Ranch is able to take advantage of native grasses at different times of the year and maximize forage production and usage. The abundance of spring and summer pastures, furthermore, facilitates rotationally grazed and regular rest for these areas. The private USFS Grazing Permit for 203 animal units is used annually from early July to early September. Natural boundaries serve as borders for much of the allotment with only about a mile of fencing that requires annual maintenance. The “mob grazing” practice utilized by the Ranch has proven to be successful for efficient forage usage. Coming out of the high country in the fall, cattle are grazed around Haystack Butte and gradually moved along the lower reaches of the Ford Creek and Ellis Meadows where most of the hay meadows are located. Small groups of cattle are gathered, brought into the working facilities at Headquarters, and calves are given their preconditioning shots as the Ranch prepares to ship the first week of November. Steers will ship at around 515 lbs. and 460 lbs. for the heifers. Cows remaining on the Ranch are immediately pregnancy tested with the pregnant cows sent back out on the hay meadows prior to going to winter pasture and the open cows sent to market. Bulls are put in with the running-age cows in early July. Cattle are divided into three groups with aged cows running as one group, replacement heifers as a second group, and the herd bulls as a third group. Annually, the Ranch typically runs around 200 replacement heifers, 1,000 running-age cows, and about 80 head of herd bulls. The summer haying season produces about 700 tons of hay from the flood-irrigated meadows to sustain the herd through the dead of winter. The Ranch has historically budgeted to have on hand between a quarter and a half ton of hay per cow for the feeding season. During the winter months, the cows are also provided a 37% protein block as a supplement to grazing the native pastures and the supplemental hay. The hay crop is typically harvested in late June; cattle graze the aftermath and regrowth in the fall. The Ranch efficiently rotates grazing on 35 pastures that have excellent stock water with natural waterways, springs, ponds and reservoirs. The cattle-handling facilities are well laid out and very functional with an efficient network of corrals, capable of working and sorting more than 1,000 head of cow/calf pairs. The cattle-handling facilities include a hydraulic Silencer chute with DigiStar scale set on concrete and contained within a covered structure fed by a circular crowding tub and alley system. There is also a 25,000-pound certified digital platform scale with concrete approach and wood deck. The Red Calving Shed is currently used for storage. This structure has 18 calving jugs and a veterinary room with a hot box. The calving facilities are utilized infrequently under current management, as the cows calve out naturally in the surrounding meadows. During the fall shipping season, large semi-trucks can easily access the loading chute for calves going to market. An additional working facility is located near the ranch home on lower Smith Creek. The calving barn is approximately 30’ x 60’ and contains thirteen calving jugs and a head catch area. The corrals are in good repair and could comfortably handle 100 to 150 head of cattle at a time. The LF is comfortably improved with four functional ranch homes, four simple sleeping/hunting cabins, a historic ranch compound with a horse barn, and efficient cattle handling facilities capable of working more than 1,000 cows. Improvements are appropriate, functional and comfortable, and include modern amenities such as fiber optic internet access. Ranch Compound – The LF has retained many historic and authentic structures. The horse barn and smaller outbuildings both date back to the early 1900s, as well as the original Ford and Duval homestead cabins that were assembled into the LF during the J.B. Long ownership. Main Cabin – Nestled in a stunning setting along Smith Creek, the home has spectacular views of the iconic Haystack Butte. The ranch-style, square-cut timber home, built in the late 1980s, features an open floor plan with a vaulted ceiling, two inviting river rock fireplaces, large picture windows that beautifully frame Haystack Butte, and an inviting outdoor deck. This single-story home has a comfortable, naturally flowing floor plan, excellent for entertaining. The main family room transitions seamlessly into the kitchen and dining areas. There are three bedrooms and two shared bathrooms. The home is modest in scope, but very welcoming and nicely appointed with fir-wood floors throughout and carpet in the bedrooms. The kitchen includes a commercial-grade Garland gas stove and a commercial-grade True refrigerator in the spacious pantry. The home is heated with propane gas-forced air and propane hot water heater. Fishing Cabins – There are two off-the-grid fishing cabins situated a short walk downstream from the Main Cabin. These one-room cabins are about 300 square feet each and include a covered porch, wood burning stove and modest furnishings. The setting along Smith Creek could not be more perfect for short-term guests ready to experience the LF. The Ranch includes three Boise Cascade manufactured homes moved to the property in the 1970s. These have been used for ranch employees, storage and offices. They are all in good, livable and operating condition, though could use some maintenance. Fiber optic cable runs to each of the ranch homes. Ranch Home 1 – This family home has a full kitchen, living area, two bedrooms and full bathroom on the main level, and three bedrooms, full bathroom and additional living room in the walkout, daylight basement. There is a detached two-car garage with concrete floor and small brick patio space inside the fenced yard. The home is heated with electric baseboard heat and a wood burning stove on the lower level. A mud room was added to the home, which also includes a wash sink and the washer and dryer. Ranch Home 2 – This home includes an open kitchen, dining and living space, and three bedrooms and full bathroom on the main level. A full walkout basement has additional bedrooms, which have been used for storage, the Ranch office, and a mudroom area with a washroom and bathroom. The walkout level allows easy driving access and parking for the Ranch office. The home is heated with electric baseboard heat and propane heat. Ranch Home 3 – This home consists of three bedrooms and one and a half bathrooms all on one floor. The home has a mud room upon entering the house where the washer and dryer are located, an open kitchen, living room and dining room area. This 1940s house was originally located at the Headquarters before it was moved to its present location along lower Smith Creek, just downstream from the Headquarters. The house is heated with a wood-burning stove insert and electric heat as a backup. It also uses an electric hot-water heater and electric stove. Ranch Compound – The LF has retained many historic and authentic structures. The horse barn and smaller outbuildings date back to the early 1900s, as well as the original Ford and Duval homestead cabins that were assembled into the LF during the J.B. Long ownership. Horse Barn – With eight large horse stalls, tack room and hay loft, the historic horse barn is one of the original ranch structures. The barn, with its tang of horse sweat and leather, is in very good repair. Tool Shed – Used for storing fencing materials, supplies and yard tools, the shed is also an original ranch structure and is in very good condition. Shop – The main ranch shop is about 40’ x 60’ with roll-up doors on both ends, post-and-beam construction, and a tin roof. About half of the floor is concrete. The building is not insulated or heated but does have 220-volt power and newer wiring throughout. Electricity is provided by Sun River Electric Cooperative based in Fairfield. Telephone and fiber-optic internet service are provided by Three Rivers Communications. Propane and ranch fuel are delivered by Breen Oil based in Choteau. Domestic water for the homes and corrals is provided by individual wells. All residences are on individual septic systems. The annual electric, telephone and internet costs are approximately $ 9,672. The annual propane and fuel costs are approximately $12,035. The Sellers will convey with the property 100% of whatever mineral, oil, gas, geo-thermal, hydro-carbon and gravel rights they own, subject to reservations by previous owners. The Sellers make no representation as to the quantity or quality of any mineral or other sub-surface rights appurtenant to the LF Ranch. The real estate taxes for 2017 for the LF Ranch were approximately $27,167. The LF Ranch controls an extensive number of irrigation and stock water rights on streams and stock ponds with very good priority dates. A complete list of water rights and water right claims controlled by the Ranch is available upon request through our Bozeman Office. In this document, water rights refer to post-1973 rights for stock, domestic, or other uses that have been issued permits or certificates for use. Water-right claims refer to pre-1973 rights, including decreed rights made by the Ranch that have not been fully adjudicated by the Montana Water Court. 61.66 CFS A flow rate for 10 decreed water right claims out of the Ford Creek, Goss Creek and Smith Creek. The priority dates of water rights on the LF Ranch start as early as 1872. The LF has the notable distinction of holding several mountain peaks on deeded ground. The elevation rises about 3,400 feet on the property from the plains to the mountain peaks. The highest point along the western edge of the Ranch at the peak of Crown Mountain is about 7,600 feet above sea level. The eastern edge along Highway 435 is at approximately 4,300 feet. The Ranch Headquarters on the LF Ranch Road is about 4,440 feet above sea level as is the airstrip. Because of the surrounding mountains, the massive acreage and the diverse terrain, along with the variations in elevation, there are many microclimates within the confines of the Ranch. The average annual precipitation in the area is 12 to 13 inches with a typical growing season of approximately 129 days. The long hours of summer sunshine combined with the majority of the rainfall in May and June provide a favorable climate for dryland farming. Average high temperatures in June, July and August range from 72° to 81° Fahrenheit. In December, January and February average high temperatures are between 32° and 41°. Summer average minimum temperatures range from 45° to 51°. Winter average minimum temperatures are typically between 11° and 16°. There is plenty of sunshine throughout the year. 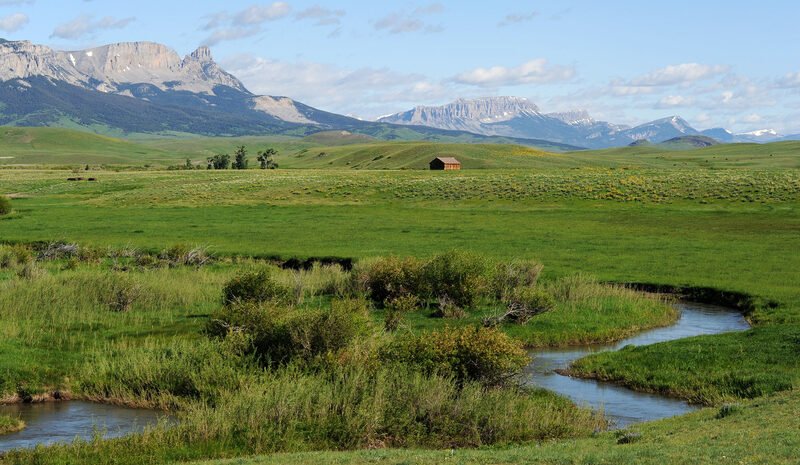 Montana rancher J.B. Long assembled the LF from several homesteads he acquired in the early 1900s, drawn to the property by the exceptional fishing resource, stunning landscape, and productive livestock operation. Long, who began his ranching career buying and feeding range sheep, left his native Cambridge, Massachusetts, when he was 20 years old and headed west, eventually landing in Montana. After some hard times in the early 1890s, Long developed one of the greatest livestock enterprises Montana has ever seen, owning, with his associates, at one time up to 175,000 sheep. Ballie Buck, a legendary Indian Cowboy who was instrumental in the start of the Calgary Stampede, was JB Long’s general manager. Ballie made his mark by engraving his name on the barn door, which can still be seen today. According to local lore, famed western artist Charles M. Russell was friends with a ranch foreman on the LF and would visit and camp along Smith Creek. Carl W. Johnston, who was married to Sarah Long – J.B. Long’s daughter, took over the Ranch in the 1930s. Carl passed away in 1952; and when Sarah died in 1988 she passed JB Long and Co. to Fred, one of their four children. Fred Johnson, an attorney from California, opted for the ranching life and took pride in his portion of the Ranch. He kept impeccable records of the cattle and ran a cook house for the cowboys to gather for supper. Being disconnected from his family and with no children of his own, Fred willed the Ranch to the respective foundations at Yale and Stanford Universities where he had attended. These Foundations held onto the Ranch for a year before selling it to the Pierce Family in 1989. The Pierce Family, being only the second owner in more than a century, expanded the Ranch with the strategic acquisition of five neighboring ranches to compile the present day offering. The focus of their ownership has been to enhance the natural resources of this wonderful holding. 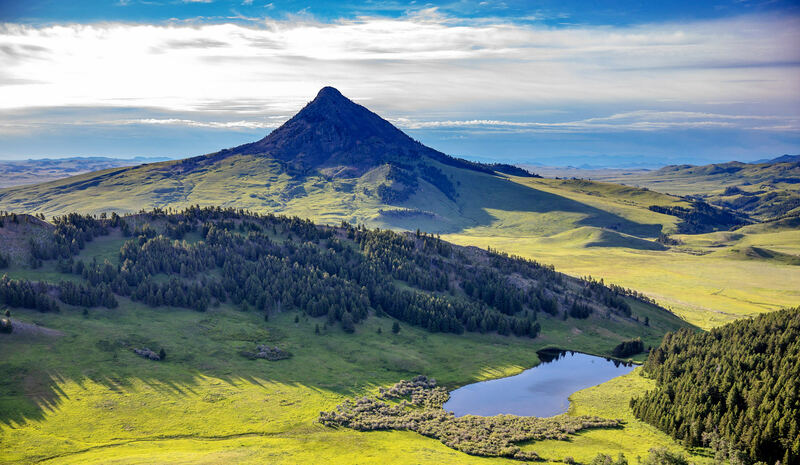 Camping near present-day Augusta in 1806, Captain Meriwether Lewis made several references in his journal to “Shishequaw,” the peak known today as Haystack Butte, and rightly noted the “extensive, beautiful and level bottom” of the prairie surrounding the area. The iconic butte has served as a sentinel and landmark to travelers, hunters and trappers since before the area was settled. In one of the cliffs on Haystack Butte there is a resemblance to a human head, and legend states it was likely the object of worship and ceremony with beads and offerings found next to rock piles at its base. Rich grasslands enticed many settlers to the West. In the 1860s, cattlemen were arriving in this area to take advantage of the prairie grasses to feed their herds. Around this time, it is said there were more than a half a million cattle in the immediate vicinity. In May 1893, a town site was surveyed and dedicated near the confluence of Elk Creek and the Sun River, and soon named Augusta after Augusta Hogan, the daughter of rancher D.J. Hogan and first child born in the town. Serving as a supply center for the cattle- and sheep-raising regions along the Sun River Valley, Augusta has remained a historically intact and excellent example of a small Montana town of a century ago. Located on the prairie east of the Rocky Mountain Front, Augusta enjoys one of the nation's most spectacular backdrops. The Front has long been sacred country to the Blackfeet Nation and served as the hunting grounds for the Blackfeet for generations. The great herds of bison, which sustained the Blackfeet, roamed by the millions across the plains and in the shadows of these mountains. The Blackfeet referred to The Front as "the Backbone of the World." The scale, recreational amenities, and overall diversity make the LF one of the most unique offerings we may ever see in the Northern Rockies. The remarkable condition of the abundant fisheries, wildlife habitat and range land are a product of almost 30 years of careful stewardship and direction under the Pierce Family. The protection of private lands along The Front has been at the forefront of many regional and national conservation organizations for decades. 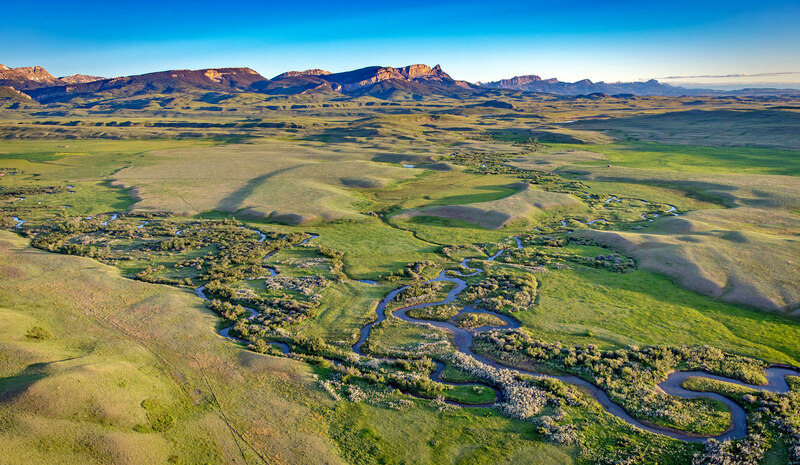 The opportunity to place a conservation easement on a ranch influencing a footprint of more than 40,000 acres in an ecologically-significant region, such as the LF, would be a pinnacle accomplishment for a multitude of conservation organizations. Buyers should first consult with their accountants and financial advisors, but the conservation and tax benefits to a high net worth buyer are compelling. The magnificence and profile of the LF remain pale unless personally witnessed. 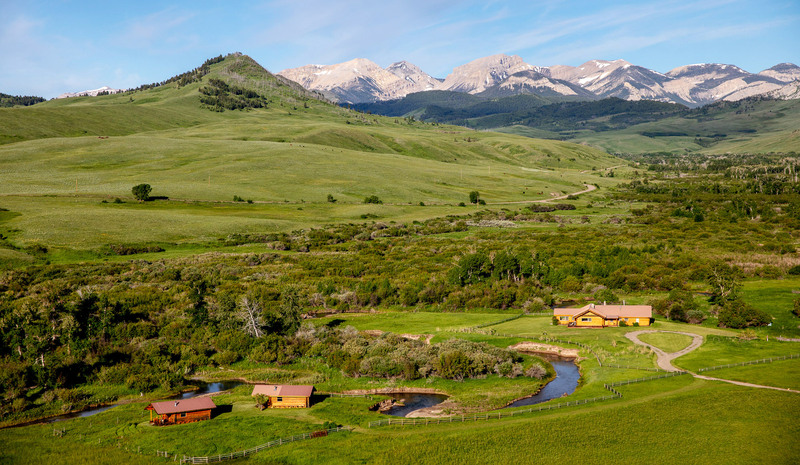 The grandeur goes beyond the breathtaking views of the Rocky Mountain Front and the abundance of pastoral stream corridors meandering through the heart of the Ranch. The LF embodies the essence of the Northern Rockies and its rugged majesty – the ultimate jewel in the Crown of the Continent. Buyers’ Brokers are welcomed and invited to contact Tim Anderson or Mike Swan in our Bozeman Office for information regarding Cooperation Policies.